Unexpectedly available from Nov. 1, 2019, forward for minimum one month rental with rate determined by length of stay: 30 days for $7000 ($233 daily) down to $5250 ($175 daily) for longer stays. Will work with per diem. Family only, no groups, ideal medium to long term, beautifully furnished residence for executive, diplomatic, U.S Government, or IMF/World Bank family. 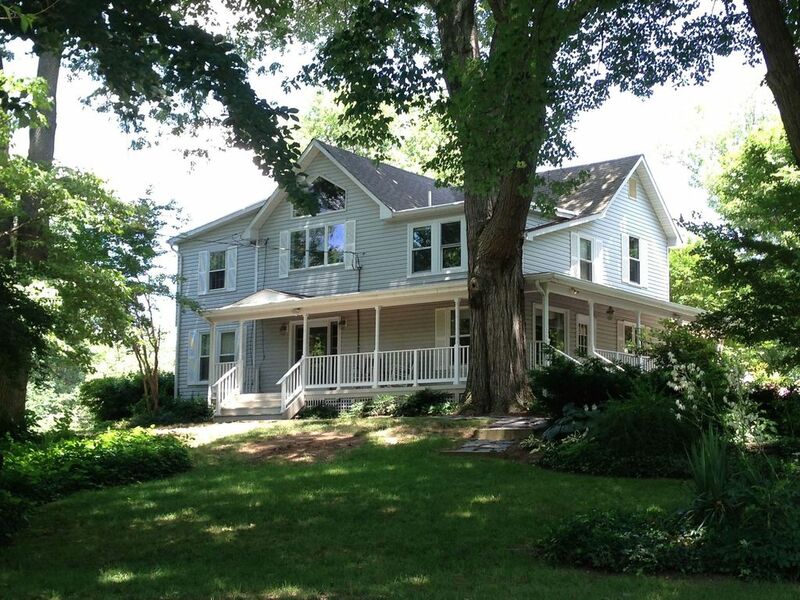 This large (3,300 sq., ft.) 13-room home includes 4-5 bedrooms and 3 full baths. It's a unique, early 1900s farmhouse, expanded & renovated, with an additional 852 sq ft. wrap-around covered porch, outdoor dining deck under pergola & a brick patio with gas grill & chiminea in a majestic, 1-acre park-like setting. First floor includes an entry mudroom, full bathroom, large eat-in modern kitchen with gas cooktop & new appliances, formal dining room seats 8, well appointed for entertaining, living room with fireplace and an adjoining study, a private family room with a new large screen smart TV, fiber optic high speed wireless internet throughout house, expanded full cable package & DVR, land line phones, computer & printer/copier/scanner. Second floor includes a master bedroom with queen bed and en suite bath with glass shower plus a shower/tub, three more bedrooms (two with double beds & one with queen bed), a full bath, a large private study with another large screen TV & DVR off of the master bedroom and a separte additional study with desk & printer overlooking the front garden. House has treadmill & exercise equipment. Rent includes membership to nearby Sleepy Hollow Bath & Racket swimming pools & tennis club. Drive to: stores & restaurants 4 min (1.5 miles); East Falls Church Metro 10 min (2.8 miles); downtown Wash DC 16 min (9.9 miles). Rent includes all utilities (electricity, gas, water, internet & phone, cable TV) and garden maintenance. This well-appointed, exceptional home provides everything you need to settle in quickly and comfortably with no additional costs. Includes fully remote alarm system, cameras & door locks. Check with owner re pets. No sub-leases. Maximum 6 persons unless waived by owner. Former U.S. Foreign Service Officer who served at many U.S. embassies abroad as well as the U.S. Senate, the White House, Treasury and Commerce Departments. I purchased this 100 year old farmhouse and beautiful lot to preserve it from being torn down and subdivided. I renovated it over the next decade and it was a wonderful family home for my four daughters. It is open and ideal for entertaining, close to schools and parks and allows quick access to Washington D.C. It is close to Seven Corners & Lake Bancroft. This unique and fully furnished home is ideal for short to long-term stays in the Washington D.C. area. The wrap around covered porch and connected outdoor dining area, plus the many windows and glass doors overlooking the landscaped and treed gardens, provide beautiful vistas through all seasons. The living room fireplace & outdoor ciminea make it an inviting home for winter. Year round garden/lawn maintenance insures the property remains in beautiful condition. On second floor the master bedroom has en suite marble bathroom with glass shower & jacuzzi tub/shower & double vessel sinks. Also on second floor one single bathroom with Jacuzzi tub/shower and sink next to bedrooms 2,3 & 4. On first floor one bathroom with glass shower, toilet & vessel sink. High speed, fiber optic internet with router that provides wi-fi throughout house and on outside porch and outside dining area. Treadmill, rowing machine, exercise bench with weights. Keurig single cup coffee brewer, electric tea kettle and European coffee filter pots. Renters have membership access to private tennis & pool facilities nearby (Sleepy Hollow Bath & Racquet Club). Rent includes access to nearby private Sleepy Hollow Bath & Racquet Club with two pools, tennis courts, snack bar & picnic areas. The owner was wonderful, the house amazingly furnished with lots of space and all this in a great location! We hated to leave but we will be back again. I loved having you in the house. You were a wonderful family and the perfect tenants. Hope I see you back in the DC area soon! Incredible home and an incredible experience!! Loved this house!! Our family lived in this home for approximately 11 months and it was an incredible experience! The home has a fantastic mix of "old DC charm" and a modern touch. It is very clean, well taken care of and spacious. The beauty of the home is definitely matched by the beauty of the property it sits on...large, mature trees give quite a bit of privacy and shade in the summertime. The neighborhood is also very nice - quiet with nice neighbors who maintain their properties. Finally, as much as we loved the home we cannot say enough good things about the owner, Todd. He was extremely attentive, very responsive and such a pleasure to work with. We cannot recommend this home strongly enough...we would absolutely stay here again!! Thanks for the kind review. I could not have asked for better tenants or a nicer family who cared for my home as if it was their own. It was a wonderful experience for me & I hope you return to DC soon. The home is a very comfortable home with plenty of room inside and out. Although it is in a residential area, it has a large, beautiful lot in a quiet area. We greatly enjoyed the deck and front porch where we could relax and watch the birds. The home is well stocked in the kitchen and elsewhere. The owner was very responsive---both quick responses and detailed information---- to all of our inquiries and needs both before and during our stay. We would stay there again. Photos were accurate as to the home. I cannot say enough good things about this house. Location, amenities, space--it has it all.Needing to leave our Foreign Service post unexpectedly early due to unforeseen circumstances, we came across this listing after being told by many other furnished apartments that they did not have 3 bedrooms. What luck! We could not have been happier. Todd, the owner and former Foreign Service officer, totally understood our needs for billing and he was always accessible, even when he was on vacation in Europe! He also was flexible with check in. The house has everything you need to move right in, right down to laundry soap, toilet paper, even first aid kits. After coming back from overseas, this place was the perfect place for our family of four to relax while we looked for a house in the area. Also, the space was perfect for me to continue homeschooling our daughters. The owner even has printers for your use. The house is close to everything, yet you feel far away from the chaos. We even walked to the park regularly during our six week stay. Hands down best owner we've worked with and best place we've stayed at. I would have stayed the year! This Home is everything it claims to be and so much more!!!!! Best Rental Experience!!!! Beautiful home in a great area. The home is very well cared for and made my visit even better. Was able to relax and destress. Very close to alot of history including Great Falls Park, Manassas Battlefield, Cherry Hill Farmhouse and great bike trail which qas less than 1/2 mile away. Great place to rent for families and alot a land for kids to run around on. The owner was outstanding, very easy to deal with and made sure I had everything I needed. Rather stay here than in DC. Was only a 15 minute drive to DC / museums. (Military and Law Enforcement: Only 5 minutes to Fort Myer home to Old Guard/Arlington). Home situated in park-like setting in close-in suburban Falls Church, near shopping & restaurants. Nearby metro subway stations to downtown Washington D.C. which is 9 miles (16 min) away by auto or Metro. Note rent declines monthly by length of stay. First month $5700 ($190 daily); second month $5400 ($180 daily for 2nd month); third month or more $5250 ($175 daily for 3rd & subsequent months). Cleaning fee $250 for one month rental, no fee for two month or more rental. Consult owner regarding renter protection/damage insurance.